Virgin Australia has chosen Melbourne-Hong Kong as its first route to North Asia, with the inaugural flight set to take off on Wednesday July 5. The airline said on Tuesday it would operate the route five times a week with Airbus A330-200s as part of a proposed alliance with HNA Group-affiliated carriers. 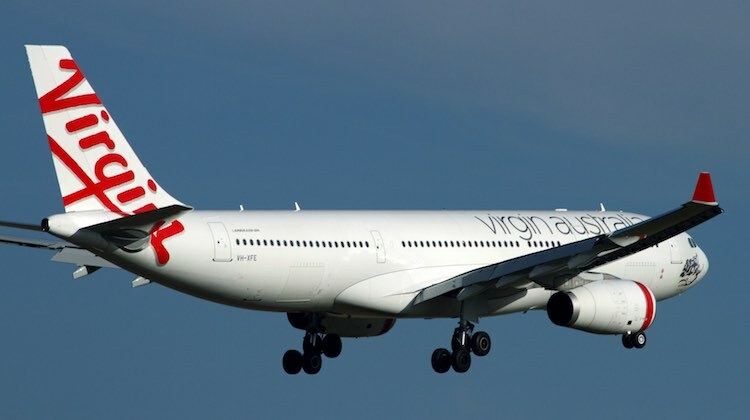 Flight times show the service will operate as a morning departure from Melbourne on Mondays and Wednesdays, while on Tuesday, Thursday and Saturday Virgin has scheduled an overnight flight arriving in Hong Kong in early morning. The reciprocal Hong Kong-Melbourne service departs in the early evening for a morning arrival into Melbourne. Cathay Pacific (three daily flights) and Qantas (daily) are the only two airlines currently offering nonstop flights between Melbourne and Hong Kong. “Virgin Australia’s entry into Hong Kong and Greater China is a key pillar of our international strategy, allowing us to tap into Australia’s fastest growing and most valuable inbound travel market,” Virgin Australia chief executive John Borghetti said in a statement. Ticket sales will begin on Wednesday, Virgin said. The airline’s A330-200s are configured with 20 business class seats with direct aisle access for every passenger and 255 economy class seats. On Monday, the Australian Competition and Consumer Commission (ACCC) granted interim authorisation to the alliance with HNA Group and its affiliated carriers, paving the way for ticket sales to begin. The ACCC said it had decided to grant interim authorisation given the tie-up “appears likely to result in some public benefit and limited public detriment”. A final decision was expected in the coming months. Virgin’s alliance with HNA Group-affiliated carriers would involve codesharing, reciprocal frequent flyer benefits and cooperation on joint-pricing and scheduling of services between Australia and Hong Kong and Australia and mainland China. There were also other areas of cooperation to achieve “cost synergies through aircraft scale and utilisation benefits as well as benefits from using catering, ground handling, cargo and other operational benefits”. The application to the ACCC said the alliance would offer travellers more choice and increase competition, noting Qantas and Cathay Pacific had a combined 99 per cent share of passengers and capacity on nonstop services between Australia and Hong Kong in 2015/16. Virgin also plans to operate between Australia and mainland China, likely to be Beijing. However, no start date has been announced. The codeshare agreement would cover Virgin Australia, Hong Kong Airlines, Hainan Airlines, Beijing Capital Airlines and Tianjin Airlines’ services between Australia and mainland China and Hong Kong, including services via New Zealand and on routes within HNA Group airlines’ domestic networks, the application said. Virgin said on Tuesday its Hong Kong service would allow passengers to connect to 13 destinations in mainland China. Hong Kong Airlines is unable to operate to any of Australia’s four major gateway cities – Brisbane, Melbourne, Perth and Sydney – as there is no more capacity for Hong Kong carriers under the current bilateral air services agreement. Currently, Hong Kong Airlines serves Cairns and the Gold Coast. Hmm fly Cathay or Virgin ?? It”s a no brainer for me, Cathay wins hands down on service alone. It’s going to be tough up against Cathay and Qantas with their multiple daily flights from all Australian capitals except Hobart. They surely can’t be expecting much feeder traffic. Seems like a difficult first choice for a new route into north Asia. Virgin AU problem flying international routes where it has zero legacy / product advantage. They tried MEL-JNB previously. VA’s biggest problem is they don’t seem to have a strategy. One day they are flying PER-AUH then that’s cancelled and it’s Asia on again. I wouldn’t fly them on that or any other route internationally. I suspect the times and days are more about connections to/from China than business in HK itself. Presumably getting access to slots at Hong Kong is a significant factor behind the schedule?? It’s pretty obvious why this is happening, and it makes total sense from one particular investors point of view. The HNA group has a massive investment in the airline, along with ownership and investments in many Chinese / HK based carriers. Those carriers however, are unable to provide service from HK to capital cities in Australia as all of the available options are already taken by Cathay. There are however options available for Australian based airlines as Qantas does not currently have the same stranglehold as Cathay. By investing in VA and getting VA to operate these flights, all of a sudden the HNA Group airlines will be able to offer codeshare tickets from HK to an Australian capital city. I very much doubt that HNA will allow this venture to fail anytime soon and will throw money at it until it works. It also shows that there is still some potential for growth within VA if this is successful as HK to BN, SY and PH would all be on the cards. Well said Doug, I agree completely. If Virgin are doing it then I’m skeptical about the economics. Considering the steady downward trend in profit and paying off debt with more debt and the owners pouring in more and more cash (while the smart ones – read NZ – exit), I am in no way confident that this will be a success. What is there to counter the fact this might just be another of VA’s thought balloons, clutching at straws to find something that works, even slightly. After the DPS debacle and the off again, on again MEL-LAX and PER-AUH on again, off again, there is no guarantee this isn’t just another 5 mins to 5 pm Friday idea. to quell angst at a meeting on Monday.